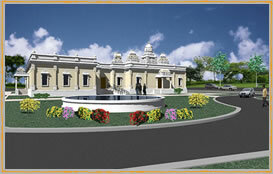 It is our pleasure to announce that the plans and drawings are ready for the construction of the Quad City Hindu Temple. This is the one of the most important milestone we achieved. Design and Architect of the Temple is prepared by Subhash Nadkarni and Larry Harrison of "Archiform Inc." We sincerely appreciate for their contribution. You may have a look into different views of the temple. You can see front side of the temple and community center. You are looking from Southeast. You can see front side of the temple and community center. You are looking from Northeast. Once you enter the temple site from the 14th Street, i.e. looking from WEST. You are looking at back side of the temple. 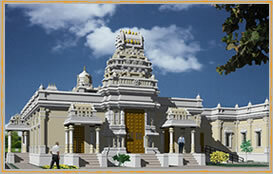 This is the front of the temple. The rightmost three windows are for the community center hall.